Pneumonia in children and infants is a very debilitating medical condition and is sometimes fatal. The symptoms of pneumonia depend on the causes and the age of the affected child. The common origin of pneumonia in children are lung infections and inflammations caused by viruses, bacteria or fungi. According to WHO, pneumonia kills an estimated 1.2 million infants and children under the age of five years, accounting for 18% deaths among this age group. It is estimated that one in three newborn infant die due to this disease. Of these deaths 85% occur in South Asia and sub-Saharan Africa. Simple interventions and timely treatment, care and preventive measures can stop loss of life. Pneumonia is inflammation of the lungs. Often, it begins as an upper respiratory tract infection affecting nose and throat which subsequently affects lower respiratory tract (lungs). The microscopic air sacs (alveoli) in the lungs bring about gas exchange, resulting in exhalation of CO2 and absorption of oxygen. In lung inflammation/infection primarily alveoli get affected. The inflammation causes alveoli to accumulate fluids and the surface area for gas exchange gets reduced. This results in respiratory distress and connected symptoms. The lung inflammation and infection is usually caused by a variety of microorganisms, including bacteria, viruses, parasites or fungi. Bacterial lung infection in children and infants is usually caused by Streptococcus pneumoniae (or pneumococcus). Other common pneumonia causing bacteria are Haemophilus influenzae, Chlamydophila pneumoniae, and Mycoplasma pneumoniae, Staphylococcus aureus, Moraxella catarrhalis, Legionella pneumophila and Gram-negative bacilli. In infants and children affected by HIV, the incidence of this disease caused by Pneumocystis jiroveci is high and 25% of pneumonia deaths are due to P.jiroveci. The viral lung infection in infants is commonly caused by Influenza virus A and B, Respiratory syncytial virus (RSV),Human parainfluenza viruses, rhinoviruses, human metapneumovirus and human bocavirus. Fungal pneumonia in children is rarer and is mostly caused by Histoplasma capsulatum, blastomyces, Cryptococcus neoformans, Pneumocystis jiroveci, and Coccidioides immitis. Parasites in human, which can affect the lungs, like Toxoplasma gondii, Strongyloides stercoralis, Ascaris lumbricoides, and Plasmodium malariae some times lead to fluid accumulation in lungs and pneumonia. Viral and bacterial infections have similar symptoms and the viral infections are more numerous. In children and infants with bacterial infections set in fairly quickly whereas the viral infections set in gradually. Malnutrition or undernourishment, compromised immune systems and pre-existing illnesses increase susceptibility of infants and children and can cause pneumonia. Environmental factors like air pollution, crowded homes and parental smoking also increase the risks. Treatment of bacterial lung infection involves administration of antibiotics and patient care. Viral infection may resolve after some time as the patient develops immunity. For severe cases and young infants hospitalization is necessary. According to WHO, vaccinations against Haemophilus Influenzae Type b (Hib), pneumococcus, measles and whooping cough (pertussis) is the most effective way to prevent pneumonia in infants and children. Pneumonia in elderly - causes, symptoms, prognosis and treatment. Tear ducts - Blocked tear ducts in newborn - Dacryostenosis. 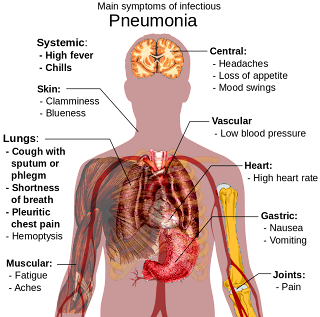 Social anxiety depression - Social anxiety disorder causes. Horseradish roots - Horseradish juice - Health Benefits. Severe hypothyroidism - side effects of hypothyroidism disorder. Chronic sinusitis treatment - balloon sinuplasty. Cloves (Syzygium aromaticum) - Health benefits of cloves. Prevent back pain in children from heavy backpacks. Celery juice nutrients - Health benefits.